The Lenovo YOGA S730 is a thin and light notebook. The dark grey color looks awesome, the aluminium covers feel premium and it also has a great CPU inside. 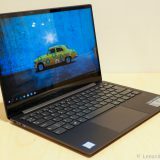 I received the YOGA S730 for review purposes from Lenovo. Thin and light notebooks have been their own category for quite some time now. The S730 tries to achieve an even smaller form factor by using an edge-to-edge display. It also uses premium materials to be both durable and light. The YOGA S730 comes in a gray box that has been used with YOGAs before. The packaging is simple and elegant. As I took the notebook out from the box, it felt light and cool to the touch. This is because of the aluminium body. As you open the lid you are greeted by a gray keyboard and a screen that has barely any bezel on the sides. The top one is also thinner than usual, and still manages to hold a webcam. The notebook looks fantastic from the outside. The Iron Grey color is a very dark grey, and looks awesome. You can certainly take this into a business meeting, the dark color looks very professional. As you touch it, it feels cool to the touch. This is because both the display cover and the bottom is made of aluminium. And it is certainly not a giant. 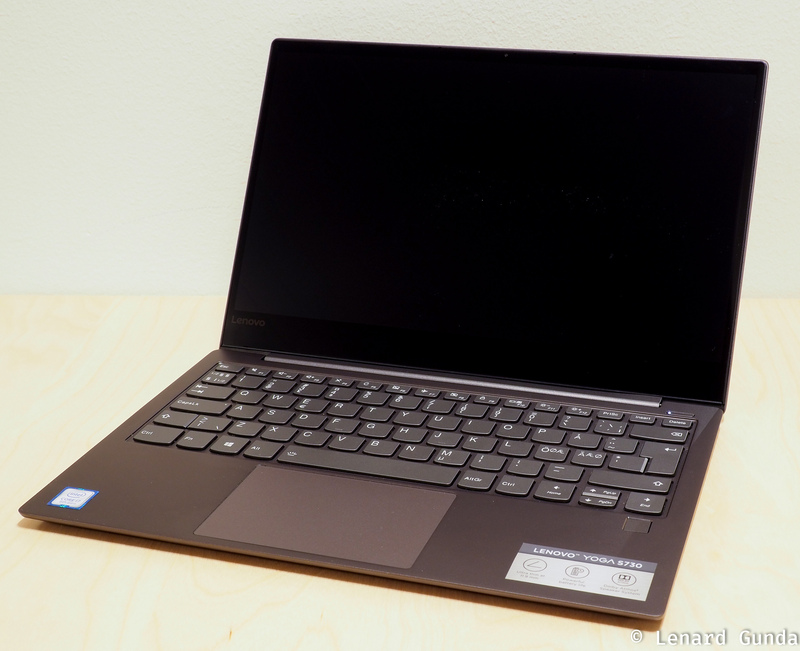 For a 13″ notebook, the S730 is surprisingly small and light. 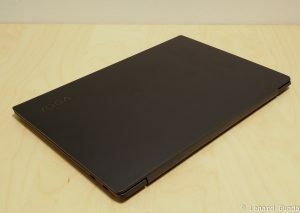 The footprint is only 307 x 210mm and the notebook is 11.9mm thin. It weighs 1.1kg, and it feels really light. Even though the S730 is very light, it feels very well built. The touchpad also feels excellent: it is a glass touchpad. 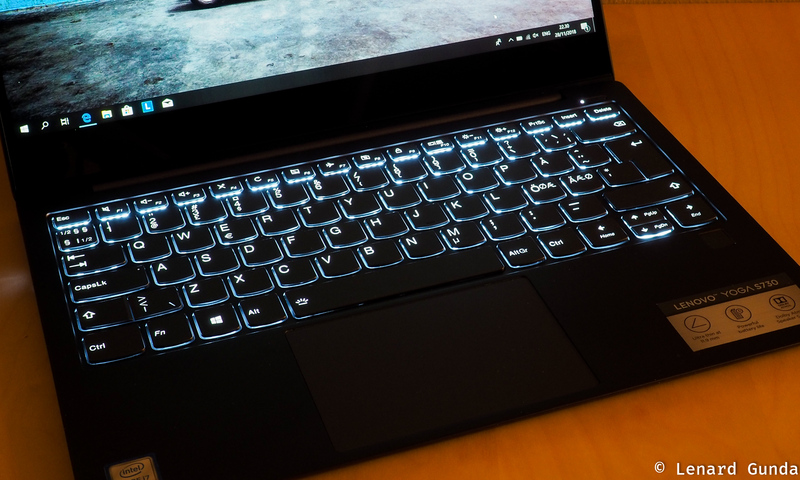 The display stretches from edge to edge, which becomes even more pronounced as you turn on the notebook. It is great to have edge to edge display, which allows the notebook to achieve this small size. Display: 13″ Full HD 1920×1080 IPS display (non touch). Open up to a maximum of 180 degrees! Build quality is excellent. 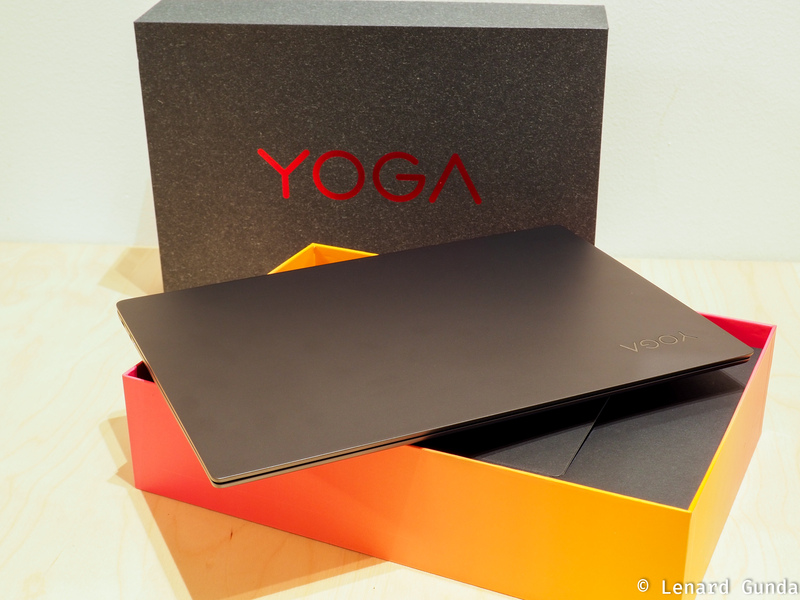 Nothing less do I expect from the YOGA line, which is the new premium consumer line for Lenovo. The base is very sturdy, and you need to press with force to have any effect. The hinge is strong, and the screen does not wobble. Pressing the back of the lid also does not produce any distortions on the screen. 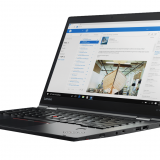 This year brings a change to how Lenovo names it’s products. 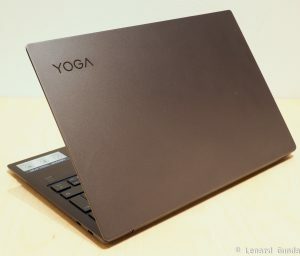 The YOGA name no longer signifies a 2-in-1 convertible computer. 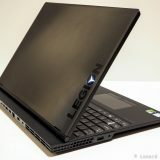 It is just the name of the premium consumer product like that Lenovo produces. You now have to look at the first letter of the product to know what you are dealing with. In this case, the S in S730 means Slim. 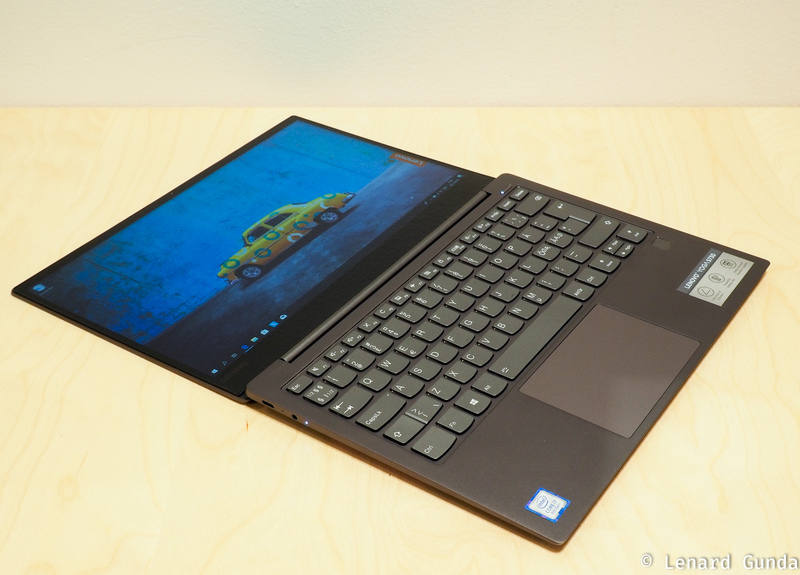 It is a traditional notebook form factor, but very thin and light. Yet it has a large display, thanks to going edge to edge. The C stands for Convertible from now on. 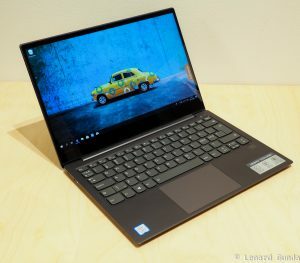 So this year, the 2-in-1 convertible is called C930. 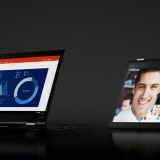 I personally think this was a horrible decision from Lenovo. For years people have been looking at the YOGAs and everybody sort of expects a YOGA to mean a convertible. 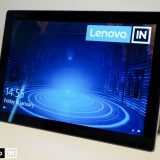 This is even made worse by Lenovo itself falling into this same trap: just the other day the Nordic Lenovo branch run an advertisement, saying: no need to decide between a tablet and a regular notebook, now you can get both with the S730. Luckily the advert was removed later on. But there is no touch screen here and no pen input and no tablet mode. The screen opens 180 degrees, and that’s it. This is how confusing things are. Don’t expect anything special in the GPU department. The notebook is equipped with an integrated Intel graphics card, the UHD Graphics 620. Because of the lack of power of this integrated card and the thermal throttling of the CPU, do not expect to play any games on the S730 (at least not using the built in graphics adapter). Running the CineBench suite continuously, the multi core scores see a steady decline, dipping below 500 after about 10 runs. Meanwhile the CPU is holding a steady 85C temperature under load, consuming 15W and running at around 2.3 Ghz. After that 10 run threshold this dips to 13-14W and 2.1Ghz speed. Even when running at full speed, the sound of the fans is not terribly loud. Let it rest for a while and the CPU goes up to just above 4Ghz, but I have yet to see it turbo boost up to 4.6Ghz (the Intel spec). 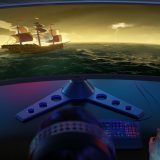 For me, the results show that the computer has plenty of computing power to start apps and do operations in apps, but give it continuous workloads like compiling, video editing or 3d rendering or games, and the CPU will be the bottleneck. This is not a surprise, given how thin the notebook is. The CPU cannot be cooled properly in a notebook of this size. This is the price you pay for size and thickness. 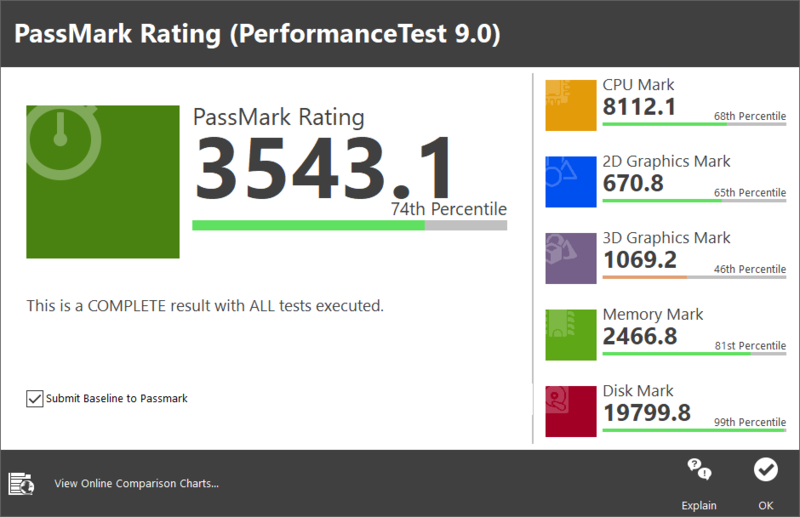 I also ran PassMark and UserBenchmark. PassMark results are included in the table below. 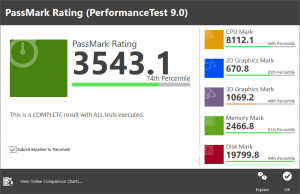 UserBenchmark results are hard to reproduce on this blog, so I will include the links to those. 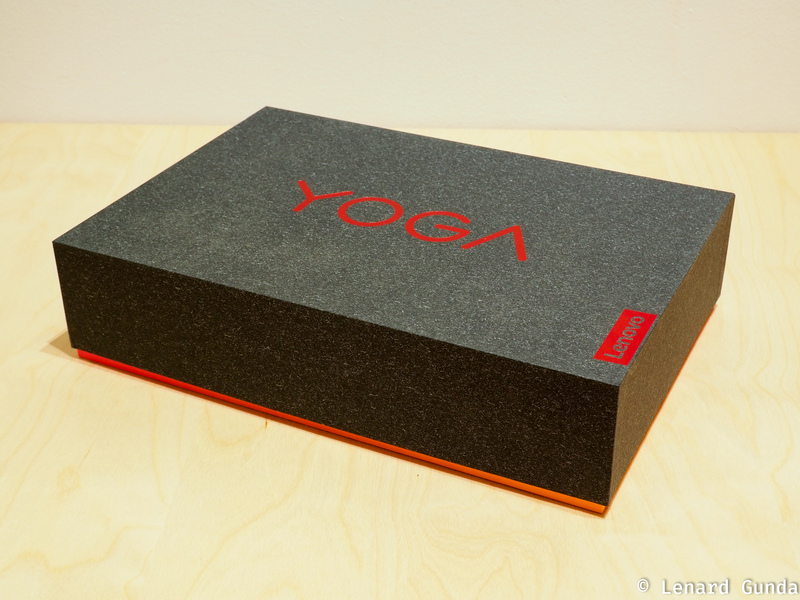 The YOGA S730 has a 512GB drive, but you can configure one with anything from 128GB to 1TB. 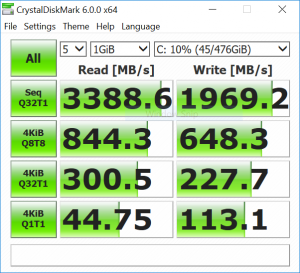 The drive in my unit is a Samsung PM981 NVMe PCIe M.2 SSD. 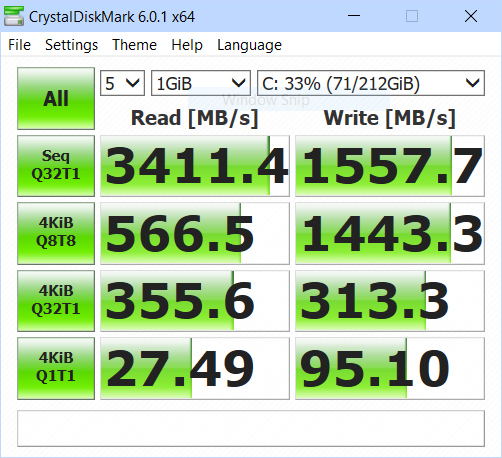 The SSD is really fast, I doubt the SSD would be a bottleneck for any kind of operation you throw at this notebook. It felt speedy and reacted immediately to whatever I asked it to do. one of which is a USB 3.1 Type-C port and doubles as the charger port. There is also a 3.5mm jack and a reset hole. And that’s it. I don’t really like that other companies are going after Apple in getting rid of all ports except Type-C. Yes, USB Type-C is probably the future, but that future is not yet fully realized. A good selection of ports is more important in my opinion. 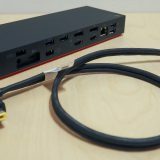 The MacBook Pro with pure Type-C ports has been around for 2 years now, and we still use dongles. And you will need dongles with this one as well. At least include some adapters in the box if you want to have a USB Type-C only product! As soon as I started typing on the S730 keyboard I felt almost instantly comfortable with it. The key travel is a little bit on the small side for me, but I can understand that in a thin product there will not be a lot of key travel possible. The pressure needed to push the buttons is ok, but the feel of the buttons is a little bit clicky. I prefer the smooth key feel of the ThinkPad keyboard. Actually the S730 keyboard reminds me a little bit of the new MacBook Pro keyboards – the one with the butterfly mechanism – but the YOGA S730 has more key travel. Which really saves the S730’s keyboard, because the MBP keyboard is just plain horrible for typing. I would give the typing experience a 7 on a scale of 1 to 10. (I would rate the MBP keyboard a 3 on my scale). The touchpad feels smooth. I think it is a glass touchpad. You can tap or click on it to register buttons. 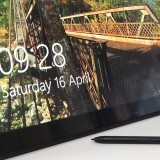 The surface itself has also support for multi touch. The S730 comes equipped with a FullHD display (1920×1080). The display is very bright and sharp, text looks very easy on the eyes. I really liked that the display goes from edge to edge. Brightness is very high, I find it that I only need about 40% in a well lit room to see the display comfortably. Colors seem rich and it was great watching videos on this screen. I was impressed by the speakers on this model. I have heard all kinds of notebook speakers, including ones that had fancy branding attached to them. The S730 does not have fancy branding, but the speakers sound very good. And not just good, they are very loud as well. And I mean really loud. 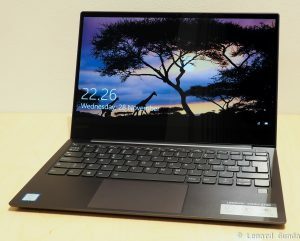 I wonder how they put in so good speakers in a notebook that is so thin and light. The sounds feel very rich. I am positively amazed by the performance of the speakers. I am not used to getting this level of quality in notebooks. Even music listening is more enjoyable here than on the average notebook (it will not beat your dedicated speakers, of course). I tried different genres like jazz and house music, and it sounded ok. Together with the great screen, this notebook is especially good for watching movies and consuming content or listening to music. When you connect headphones, you can then take advantage of Dolby Atmos. Headphones sound rich and good. I cannot say how much Dolby Atmos affects this. But there were no issues or noises when using headphones. The S730 has a 1.0MP 720p webcam. It is located at the top of the screen, which is great news. Edge-to-edge screens often come with “nose-cams”, that are situated at the bottom of the screen (and show you from below). I am glad Lenovo was able to squeeze in the web cam to the top of the scren. The web cam is nothing special, the image is a little bit blurry, but the cam itself is tiny for it to fit onto the top of the screen. As usual, I do not perform detailed battery life measurements. I try to use real world usage. 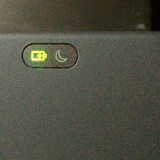 During my time with the notebook, I have seen the following battery life. Light usage. Typing articles, no stressing the CPU will give you about 12 hours of battery life. Medium usage. Using browsers, downloading things immediately starts stressing the CPU and you can expect 7-9 hours depending on what you do. If you stream video / music, this drops to about 5-7 hours. Medium/light usage should get you through an entire day. 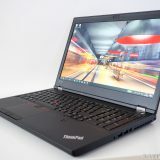 The YOGA S730 comes clean of unneeded software right out of the box. You can start installing your own programs right away, there is no need to perform a clean installation of Windows. The only third party app installed is McAfee virus scan, but that is easily removed if you do not need it. (McAffee is a trial software, so you need to purchase it after 30 days). Other than this, the notebook comes preinstalled with all the usual great Microsoft crap-fest of Candy Crush and friends. I really wish Microsoft would stop preinstalling junk and populating shortcuts. 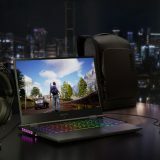 At least ask me during setup: do I want some recommended software and shortcuts installed? 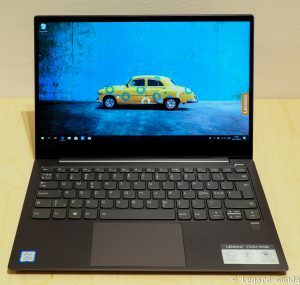 The YOGA S730 is a very nice package: It provides enough performance for most tasks, is speedy and at the same time is light and small – portable yet capable. Build quality is excellent. You will not play AAA games or render your next movie project on the S730, but then again, these are not the things the S730 excels at. Instead, if you want a general purpose computer that gets you through a work day without needing to charge it and has a very comfortable typing experience, then you will appreciate the S730. There are some shortcomings, like the all USB-C port selection. I also miss a touch screen, even if this is not a convertible computer. 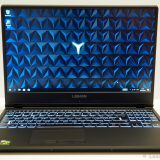 I find operating a computer using touch very comfortable and fast. 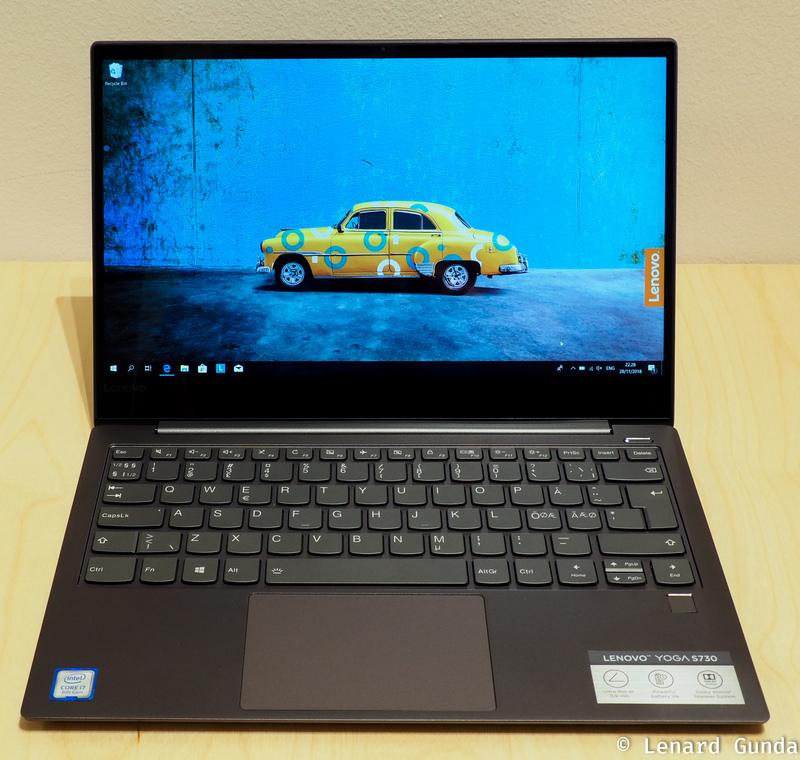 For office work, note taking and content consumption, the YOGA S730 is a great device. The looks are certainly professional enough, that you could use this in a business setting. 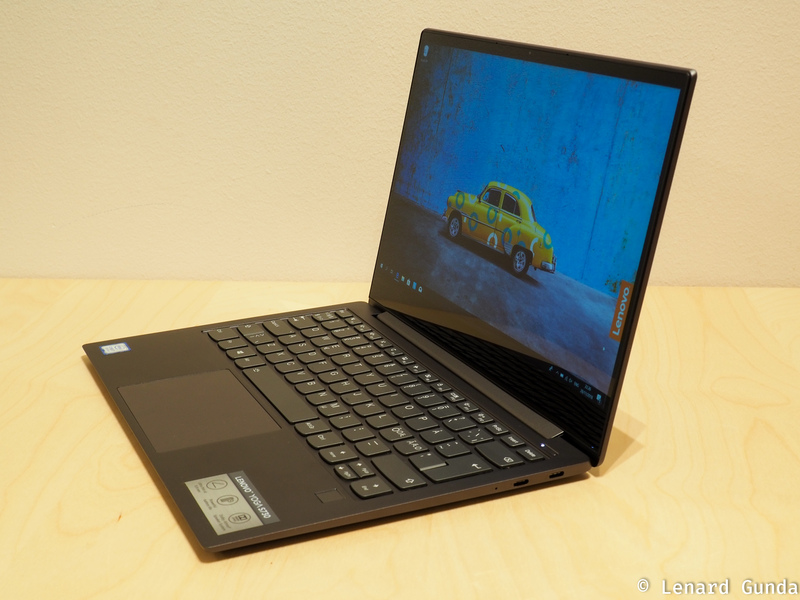 Executives or project managers could certainly fair well with the YOGA S730. 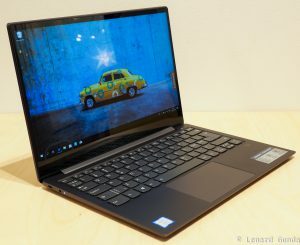 In fact, going forward if anyone asks me for a general purpose computer, the YOGA S730 is a solid contender. If you are a developer, the throttling in the CPU is something that is probably going to bother you, and you should probably look at something “thicker”. That said, if you are just writing light web apps, this notebook might be enough for you. If you are a content creator, the CPU is not going to be stellar at rendering videos or graphics, and you should probably skip this model. For photo editing, this could be a great little on-the-go companion device. If you are a gamer, then you should skip the S730. The thin and light construction is very limiting on the CPU, even if you would add an external GPU to the mix. For students, this could be a great companion and note taking device, but only if you prefer typing your notes. The S730 does not support a digital pen. So if you prefer using a digital pen to draw or annotate or prefer writing your notes by hand, then the YOGA S730 will not be for you.